The Keystone KSTAT12-1B 12,000 BTU 115V Through-the-Wall Air Conditioner with "Follow Me" remote control is perfect for cooling a room up to 550 square feet. It has electronic controls with LED display and a temperature sensing LCD remote control allowing you to conveniently see, set and maintain the room temperature from across the room. A programmable 24-hour on/off timer cools the room on your schedule. Additional features include energy-saver mode, sleep mode and auto-restart. This unit is designed for through-the-wall installation and is not designed for standard window installation. 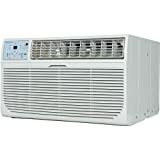 Keystone KSTAT12-1B 12,000 BTU 115V Through-the-Wall Air Conditioner with "Follow Me" LCD Remote Control 3.6 out of 5 based on 10 ratings.